Join Us!!! We are looking for someone to help us cover Kittitian basketball. Please send us an e-mail. The concept of an NBA prospect having a 'high ceiling' is something that's often discussed, but rarely defined. Is this the most exciting thing we can say about a player on draft night, meaning that, someday, he could become that franchise cornerstone every team needs? Or are we saying that a player has the physical attributes and the athletic prowess to round into a phenomenal basketball player, if he puts in the hard work and gets some lucky breaks? Or is that term a backhanded compliment of sorts, where a talent evaluator is saying that, yes, the player has enormous natural abilities, but that he never reached that high potential in college? Is 'high ceiling' the best thing you can say about a prospect, or is it the worst? A blessing or a curse? Leading into the 2014-15 college season, Karl-Anthony Towns was spoken about as a high-ceiling player. Turns out he's reaching that ceiling in the NBA already. But remember: Cliff Alexander was considered a better college recruit than Towns, and he was spoken about in the same high-ceiling sort of way. Alexander had a miserable college season at Kansas, went undrafted, and was last seen playing for the Nets - the Long Island Nets, that is, of the D-League. He never even sniffed his high ceiling. 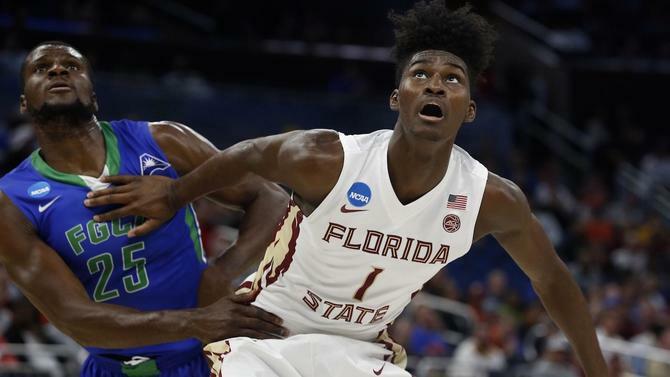 And so it is with both excitement and a bit of trepidation that I'm slapping the 'highest ceiling in the 2017 NBA Draft' label on Jonathan Isaac, the tall, athletic, versatile one-and-done forward from Florida State. He fits the 'high ceiling' bill: Isaac has the athletic abilities to wow people in the NBA. He has the body that ought to fill out, a rangy 6-11 frame that his college coach told me could still be growing. And he has a skill set that is rare for a big man, as a late growth spurt turned him from a slender 6-foot-6 high school wing overlooked in the top tier of college recruiting into a near 7-footer with the playmaking and shooting abilities of a guard. Needless to say, Isaac's ceiling has NBA scouts drooling. One scout told me Isaac is the one player in this draft he sees as being in the rarefied air of 'freak NBA athletes,' a term the scout reserves for players like LeBron Jamesand Paul George and just a handful of others. So is this label a blessing? Or is it a curse, the idea that in the future this player could outperform his past? The answer depends, I believe, on the individual. An arrogant young man who hears this talk about himself can get lazy. He can see himself as The Anointed One and not put in the work. This is the type of player for whom the 'high ceiling' label will become a curse. That's exactly the type of mentality that turns a high-ceiling player into an NBA All-Star. A nationally respected evaluator of high school basketball talent - someone who has watched Isaac develop for years - told me what jumps out to him most about Isaac's game is how unselfish he is (he also referred to Isaac as a 'mini Kevin Durant,' if that gives you any sense of Isaac's ceiling). He's not the type of player who is so concerned about filling up the box score. He knows that he'll get his. Instead, he's out there to make his team better, not just make himself look good. In an NBA that spreads the floor like it does, Isaac is the type of player who fits the modern league like a glove. He's a near 7-footer who can put the ball on the floor and knock down 3s, which he did at a 35 percent clip in college at an average of nearly three attempts per game. He rebounds in traffic, he makes free throws, he doesn't pass up open looks, he makes the pass that leads to the pass that gets the assist. He was the most effective shot-blocker and rebounder for one of the tallest teams in college basketball. But what Hamilton believes will make him most valuable in the NBA isn't necessarily just his effectiveness close to the rim. It's that he's as comfortable under the rim as he is out on the perimeter - on offense, and on defense. There's not a big man in this draft who'll be as effective switching on pick-and-rolls as Isaac is. I can't say with 100 percent certainty that Isaac will make that leap. That's why the NBA draft is always filled with so much intrigue; these young men are unfinished canvasses onto which we can project our own hopes and desires. One of the highest ceilings in recent memory was Greg Oden and, through a rash of misfortunes, he became a historic bust. And nobody was talking about the high ceiling of a player like Draymond Green on draft night. Green became one of the biggest steals in NBA draft history. There are so many factors at play on whether a player falls short of or far exceeds his potential. But I do know this: When you take the whole package with Jonathan Isaac - the phenomenal physical profile, the off-the-charts basketball IQ, the humility, the focus - he strikes me as the rarest of high-ceiling players. He's the high-ceiling prospect who could also be the safest of bets. 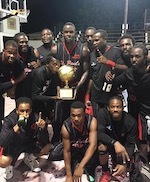 Blue Print Construction St.Pauls Tuff Knott's defeated Rams HITTERS in convincing style on Tuesday to win their 5th SKNABA National Bank Black Card Title. A Blowout 92 to 74 victory ceiled the championship for Tuff Knots after losing their Finals Game opener only to come back and sweep the next 3 games in a dominating fashion. Tuff Knott's was led by Nashorn Maynard (196-F-86, college: Alaska-Fairb.) with 23 points and an amazing 28 rebounds,5 assist,8blocks. Dearmine Rawlins capped an MVP type series with 23 points,4rebounds,3 blocks and Clayton Powell (180-G) 16points,6 rebounds,6assist,5 steals. HITTERS was led by Daryl Lewis (185-G) with 20points,4rebounds,3 steals,2 blocks. Duane Willock 17points,6rebounds,5 steals,3blocks. Tyrone Hutchinson 15points,10rebounds,3assist,4steals. Business Executive Mr Glen Jeffers has moved into the leadership of the new management of the St.Kitts-Nevis Amateur Basketball Association St.Kitts-Nevis Amateur Basketball Association voted unanimously to appoint former President of the SKNAAA on Thursday, in a step toward reform for an organization which has in the past few years has seen a significant decline in the level and quality of management, operations, officiating, development and transparency. Jeffers and his new team were all elected unanimously and unopposed. There were two possitions that were not voted on and those were the posts of Assistant Treasurer and Assistant Secretary. Those positions will be voted on during the association next general meeting. In comments after the vote, Jeffers said that his teams focus will be on grassroots development in addition to improvements in Officiating, Public Relations, Discipline, Financial Accountability and Transparency and Facility development. Jeffers stated that his new team will pursue reforms that would cover all aspects of the game in St.Kitts-Nevis, from the national team to youth and grassroots programs. PRIDEKINGS reign as the 2017 SKNABA Premier League Champions! 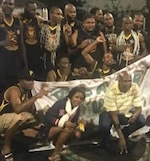 The Sandy Point PRIDEKINGS won the 2017 St. Kitts Nevis Amateur Basketball Association (SKNABA) Championship on Thursday night. In the fourth game of a possible five-game series, PRIDE defeated the 2016 champions - the St. Paul's Tuff Knots, 84-79. And the victory gave the PRIDE organization it's first premier league championship and second SKNABA title in just 2 years of existence. It is a satisfying end to a season for a team that saw their roster significantly reduced for a number of reasons, including the loss of one of it's brightest and youngest stars Secada Garroden, but on Thursday night, when time ran out at Basketball City, the KINGS and all its fans could finally celebrate a championship. The win represents the ascension of a team that had only joined the SKNABA league in 2015, who in it's first year ran the table at the A-Division level to go an impressive 19-0. Then after being promoted to the island's premier league, recruited other seasoned talented front court players to join its nucleus of back court assassins. A balanced offensive attack helped to seal the deal, with five KINGS scoring in double digits for the 5th consecutive game of their 2017 playoff run. Taslin Dont-Cheat Hodge, the early favorite for finals MVP tallied 22 points 2 steals and 4 assists. The youngest and arguably one of the fiercest competitors on the King's championship roster- Cha Vez Belboda also played a key role with 22 points and 5 steals. Graeme Browne , the hero from Saturday's overtime Game 4 win, finished with 13 points 10 rebounds 2 steals and 2 blocks. National front court player and PRIDE center Jazbu Troy Wattley registered a solid double-double of 12 points and 12 rebounds. While the team's floor general - Javal Hodge clocked 10 points 7 assists 4 steals in 37 minutes of directing on court traffic and pushing the pace. While the two sides were close in a low-scoring first quarter, a 7-0 run helped the KINGS to gain the early advantage to take a 4 point lead into half. The momentum stayed with the lions, who weathered a valiant effort from the Tuff Knots big men and seemed to make a big play whenever St. Paul's tried to come back. The fourth-quarter defensive focus and game management was all that was needed for the KINGS to slam the door on any chance of a comeback and secure it's first championship! It was truly a magical run which culminated on Thursday night with chants of 'Hub hub hub' and an overwhelming display of PRIDE by all in attendance. All hail the PRIDEKINGS, your 2017 SKNABA Premier League Champions! !